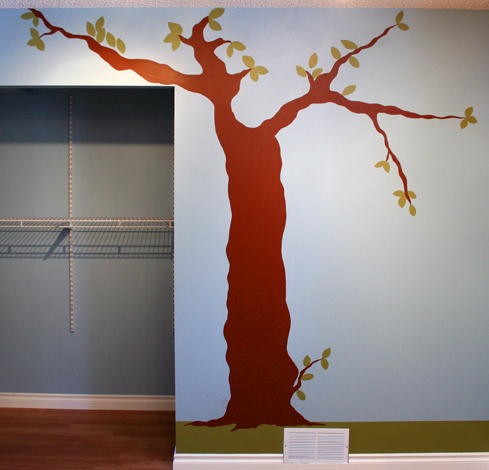 With all the finishing touches completed, I was able to have some creative time, which involved painting a tree on the bedroom wall. I love trees and their symbolic nature: life, living, growing, breathing. Bringing (artistic) nature indoors warms the atmosphere of the room and helps to cultivate the imagination. In designing the tree I wanted to convey the outline and shadow, where the shape is the feature, versus the detail. I'm pleased with the way it turned out, so are the boys. I reply: "There is still work to do on the room next to yours which involves more messy, smelly painting". I really don't want the boys breathing the fumes in during that time so for now a little patience is in order for us all. Oh and there is still so much more to do here but I really do love how things are coming together in this house. Our unique thumb print is becoming more evident project by project and "this house" is starting to feel like a home. Happy Monday, xoxo. ETA: now a part of green week going on in blogosphere. This is day 1.